How to Download from Vimeo (Available for Downloading or Not)? Vimeo, the famous video sharing site, similar to YouTube, is a little bit different from YouTube, as well. The difference lies in that some videos on Vimeo are available for free downloading while others are not available for downloading. No matter which type of Vimeo video you wanna download, you can find out the effective solutions below to get Vimeo video downloaded with nary a hassle. Certain videos on Vimeo are available for directly saving, which means anyone, no matter you are the basic member, Plus member or Pro member, has get access to download video from Vimeo for free. Here is the feasible ways. The professional yet feature-rich Vimeo downloader - MacX Video Converter Pro comes to render help, which runs as a monster in Vimeo video downloading, regardless of format MP4, FLV, AVI format or resolution in 720P, 1080P or even 2K 4K 8K Ultra HD. What's better, it can also deliver a stunning performance in save videos from other video portals, including YouTube, Facebook, Dailymotion, Vevo, Instagram, Metacafe, Myspace, Pandora TV, Soundcloud etc. To notify, with up to 350+ mobile device profiles, this world-class Vimeo video downloader can also support you to convert the videos you downloaded from Vimeo to iPhone iPad Android with all quality untouched. 1 When uploading 4K Ultra HD video to Vimeo, Vimeo will automatically downgrade and convert ultra HD video to HD 1080P/720P, and there is a download original version in 4K/8K for Pro and Plus members. 2 When a Vimeo premium user uploads a video that is 2K, 4K or above to Vimeo, which will be converted to a 720p or 1080p version for streaming and meanwhile keep an original ultra HD version for others' viewers to download if the uploader is willing to do so. For Windows users: Right-click on the link and choose "Save as" or "Save link as". For Mac users: Hold down the Control key on your keyboard and click the link, then choose "Save link as" or "Download linked file". Different from YouTube, not all the videos on Vimeo are available for you to save. When it comes to the non-downloadable Vimeo videos, what is your plan to cope with them? 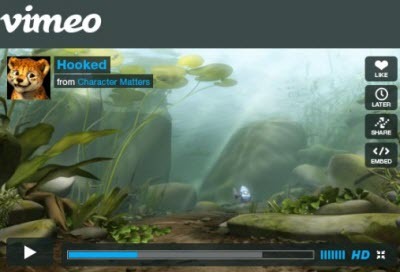 Here just shares the best Vimeo video downloader to capture Vimeo videos for personal legal use. To record Vimeo video, you can't make this magic happen without the aforementioned MacX Video Converter Pro whose screen video recording feature empowers you to free download any Vimeo videos without any quality loss. How to record Vimeo videos? Below comes the tutorial. Step 1: Free download this Vimeo video recorder on Mac OS (Yosemite/El Capitan included), fire it up and click the "Screen Recorder" button on the main interface. Step 2: Followed by Capture Settings adjustment. You can choose "Keep Full Screen" or "Crop Region" to customize the capture area, select the audio device that used to add sound to your video, or disable audio recording completely, and adjust video frame rate or other parameters as you like. Step 3: Press "older" button in output setting area and select a destination folder to save your recorded video. Step 4: When the preparatory process is done, click "Start Record" button to record Vimeo video on Mac within a few seconds. You also can stop the video capturing process at any time. Reasons Why Some Vimeo Videos (Original Video) Are Not Available for Downloading? Vimeo has three type of users: basic member; Plus member and Pro member. For Plus and Pro members, they have the ability to store their original source files right here on Vimeo. This means that they will always be able to download Vimeo original videos, as long as they pay for $59.95 or $199 per year. For Basic member, logged out viewers, or viewers without a Vimeo account, sorry to inform you that they don't the right to enjoy the original video download right. Only one way -record Vimeo videos for personal legal use. Under Vimeo Privacy Settings, Vimeo shows enough respect to those people who upload their DIY videos to Vimeo and are unwilling to allow others to get videos download. In such case, you'd better enjoy their video online and respect other's choice, unless they allow you to download someday. This guide article will show you how to download 4K/HD video from Facebook using all-in-one online video downloader. With this guide, you will also know how to convert Facebook videos to iPhone iPad and other mobile devices. Want free Instagram video downloads in for playback on iPhone, iPad, Android? Here simple guide on free download videos from Instagram in 4K UHD is shared. MacX Video Converter Pro is a two-in-one online video downloader, which can easily download and convert videos from vimeo, YouTube, and other online video sites to formats like MOV, MP4, MKV, WMV, etc, along with excellent video edit and record feature.